Only God would open up an opportunity for a Catholic from San Francisco to speak prophetically to the Prime Minister of Australia, at the Anglican Centre in Rome, on behalf of Cambodians about to lose their land in Phnom Penh. God cares that much about the poor. 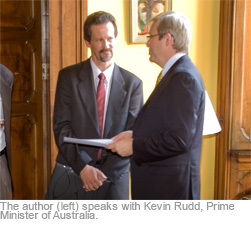 Kevin Rudd is no ordinary Prime Minister. A committed Anglican who grew up Catholic, he has demonstrated a great passion for issues of social justice. His first act in office was to apologize to the indigenous peoples of Australia. Jim Wallis has written about him, pointing out that the Prime Minister's hero is Dietrich Bonhoeffer. In fact Mr. Rudd wrote a very impressive article in 2006 on faith and politics, framed around the life and testimony of Bonhoeffer. The purpose of the church is not to be socially agreeable; it is to speak robustly to the state on behalf of those who cannot speak effectively for themselves. So, when the directors of the Anglican Centre here in Rome, David and Margie Richardson, graciously extended the invitation to join them last Thursday for the Prime Minister's visit to their Center (in Italy for G8 meetings), I was honored, grateful, and curious as to what God might have up his sleeve. Upon checking in with my colleague in Cambodia, Chris Baker-Evens, I began to see the plan unfolding. Chris, along with other Aussie Christians, has been working diligently to defend the rights of Cambodians who are being illegally evicted from their lands. In fact, right next to the new Australian Embassy construction site lives a community of 66 families, known as the 'Group 78 Community,' who are about to be forcibly evicted. They have exhausted all possible legal recourses, to no avail. At best they are being offered 10 percent of the real value of their property, meaning relocation would further impoverish them while the elites receive a multi-million dollar windfall. By chance these Australian Christian advocates met on Tuesday of the same week with Embassy personnel to discuss the plight of these newest victims of greedy development, and to encourage the Australian government to advocate more on their behalf. It was clear now that God was opening up the opportunity to bring this particular issue to the Prime Minister's attention, but how? I prepared a little write-up (at my wife Jenny's suggestion) with the help of our colleagues in Cambodia, and prayed for an opportunity to bring up the topic during Kevin Rudd's brief visit. The Prime Minister made his way around the room, speaking warmly to each person, introducing himself simply as 'Kevin.' I was the last person he got to. I mentioned how much I had appreciated his 2006 article on Bonhoeffer, and he launched off into what an inspiration Bonhoeffer and his 'view from below' had been for him. And then (here is God's amazing timing yet again) he shared that just the day before, on Wednesday, at German Chancellor Merkel's invitation, he had been in Berlin and had visited Bonhoeffer's church, home, and grave. He had sat in the study where Bonhoeffer had been arrested by the Gestapo, and taken to a concentration camp, where he was executed just three weeks before the end of the war. The experience of this visit had a profound effect on him.